Due to the characterisfics on the water PU surface food poisoning germs or putrefactive bacteria cannot survive on the glove surface resulting in ensuring safely. 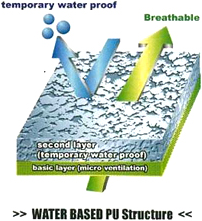 The product is environment-friendly since it uses the water UP fully exctuding the DMF harmful to a human body so that it is safe for the human body. Theallergy accident caused by the latex ingredient can be prevented. 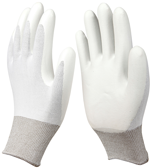 the water-based PU-coated gloves provide the excellent grip feeling in the oily work environment. 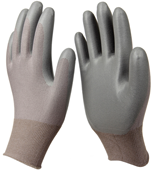 The fine air holes on the parms of the water-based PU-coated gleves show the technicality which only Shinsung Major Glove has and enable the free air circulation to maintain them without sweat in spite of wearing the gloves for a long time. Furthermore, the lightness, softness, and comfortableness of the gloves can enhance the performance of the assembly work requining the correctness and quickness. The gloves are suitable to the several work environments such as the automoblie industry, part assembly, packaging, inspection, landscaping, gardening, hiking, driving, and os on.